Computer Bild, one of the best selling German language computer magazine in Europe, has always continuously provided free copy of Kaspersky Security Suite to its readers, such as Kaspersky Security Suite Personal until May 2007 (edition 11/2007) and Kaspersky Security Suite V until May 2008 (edition 10/2008), both older versions. Since June 2008 (edition 12/2007) Computer Bild is giving away Kaspersky Security Suite CBE (Computer Bild Edition) with registration license key to unlock and activate free 1 year subscription. If you read and can use German software, it’s a good free choice. Proactive protection by monitoring all activities on your computer. Improved heuristics to detect unknown pests based on suspicious behavior. Protection from personal confidential data leakage and phishing attack. Improved spam protection to filter and remove unwanted junk mail from your mailbox. Computer Bild provides an updated and optimized spam filter list and signature that can catch four times more advertising messages than regular commercial version purchased, delivered via the free cover CD/DVD with the magazine every 3 months. 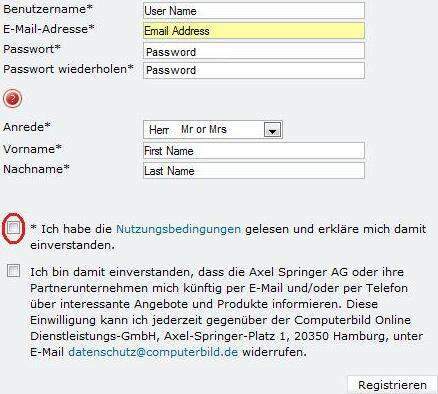 To get the free license key for Kaspersky Security Suite CBE, user needs to have an account with computerbild.de. Register for a free computerbild.de account here. The registration page is in German, refer to the following figure for reference on what each field means. Remember to tick ONLY the circled check box in RED. The only check box below is to receive marketing newsletter, which is to avoid at all costs. If you’re requested to login, simply enter your user name and password registered just now. Then tick the second check box (the first is to subscribe security newsletter) to request for personal license key for Kaspersky Security Suite CBE. The license reg key for Kaspersky Security Suite CBE edition will be sent to your registered email address. If you have subscribe to Computer Bild magazine, the setup installer for Kaspersky Security Suite CBE version comes with the cover CD/DVD. If you don’t have, the setup installer has also been uploaded to the web as Kaspersky.Security.Suite.CBE.7.0.135.GERMAN.rar. Run the setup.exe, and use the license key receive to install and activate the Kaspersky Security Suite CBE as full version product. If you want the English version of Kaspersky Internet Security, try out the free Kaspersky Internet Security (KIS) for 6 months or free Kaspersky Internet Security for 1 year, or free Kaspersky Internet Security 2009.